Keeping a taut ship is a critical part of ensuring passenger, crew, and vessel safety while underway. This includes efficiently stowing lines. Line stowage is important on any type of vessel, but especially so on sailboats, simply because so many lines are used to operate the boat. A rat’s nest of lines on a deck is an open invitation to trip-and-fall injuries, or worse, a Man Overboard. These situations can be easily avoided by ensuring that crewmembers know how to coil and stow lines. This article presents tips for coiling and stowing lines on both sail and powerboats. Some words about rope and line: the word rope refers to manufactured material; once it is sized, spliced, or simply used on board a vessel, it becomes line. Most line used on vessels is right-laid; the lay is determined by the direction of the twists as they progress away from an observer. On sailboats, some lines have other names; for example, those controlling sails are typically called sheets, and the line used to hoist a mainsail is the halyard. Understanding some terms relating to coiling lines might be a good place to start. Bitter end: The free end of a line. Eye: The teardrop loop in the end of a line. Faking: Laying out a line on deck or a dock in a figure-eight fashion so the line will run free without tangles when pulled. Flaking: Laying out line on deck or on a dock in parallel rows, not the same as faking. Left-laid rope: Rope made with the material running to the left. Left-laid rope is coiled counter-clockwise, which helps preserve the lay of the line and allows the line to coil easily and run out smoothly. Right-laid rope: Rope made with the material running to the right. Right-laid rope is coiled clockwise, which helps preserve the lay of the line and allows line to coil easily and run out smoothly. Most line used on recreational vessels is right-laid. Coiling a line is a basic function and easy to learn. Start by holding a line end in one hand; form the line into about a two- or three-foot oval as it is brought to the other hand, and hold the collected line underhand. When about two or three feet remain to be coiled, make three turns around the upper part of the coil, wrapping counter-clockwise. Make a loop in the last 18 inches of line, and tuck it through the top of the coil above the three turns. Gently pull the loose end to snug the loop against the wraps. The wrapped coil can be stowed and hung using the loose end at the top of coil. The free end of line should hang slightly longer than the coil so it can be located quickly. To coil line with an eye, shackle, or heaving line monkey fist at one end, start the coil with the eye, shackle, or monkey fist hanging below the hand and form the coils as above. Stowing lines adjacent to where they are usually set saves loads of time and stress. Some boaters use line holders, simple one- or two-inch wide plastic or canvas straps with a turnbuckle-like closure attached to the inside of the hull near bow, stern, or amidships cleats. To stow the line, it is coiled and fitted into the middle of the strap; the open end of the strap is secured around the line and attached to the hull with the closure. The straps are an inexpensive and easy way to ensure that the right lines are always available at docking points. The most common way to stow line is using a gasket coil or simply a coil. Develop the habit of coiling and stowing lines immediately after use. Most line on boats is coiled clockwise. If making a clockwise coil and the line does not cooperate, it probably is left-laid. Undo any coils and restart the process in a counter-clockwise motion. Fake or flake loose line ends to protect them from unnecessary wear and tear and to help preserve the lay of the line. Remove knots or kinks in a line before coiling. Regularly clean lines in fresh water, with small amounts of bleach and dish detergent to remove salt, sand, dirt, and stains. A dash of fabric softener helps make lines more pliable and easier to handle. Allow lines to dry thoroughly before stowing to prevent mildew. If coiling large-diameter line or several feet of small diameter line, doing so on the deck or dock rather than using the hands may be the most efficient. Coiling anchor line is a good idea; detangling a long anchor rode in an angry sea or an emergency can be dangerous and time-consuming. Braided line usually forms natural figure eights when coiled. If all the eights lay the same way, the line will run free when needed. Always monitor lines under stress and replace worn, chafed, or frayed lines. 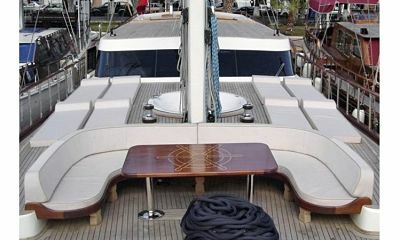 Charter guests should walk through the vessel with the owner before departing to learn where and how lines are stowed. Many boaters combine time-tested techniques, personal preference, and creativity to identify and stow lines aboard a boat. Some suggestions are mentioned below. Lines have memory; coiling in the same direction every time will eventually make them run easier when under a load and easier to handle. Different tape colors, leather strips, or other indicators attached to lines can help identify bow, stern, spring, or utility lines. Lines of different colors can distinguish line locations, with a matching color of tape at the cleat or fitting where the line is to be set. Stowing stern lines around the outside of fishing rod holders (also called rocket launchers) saves space on small powerboats. Arranging lines in a rope locker, identified by color, or a label above a hook, etc. allows quick access to the correct line. Coiling line, just like line handling, is an acquired skill. A well-coiled line, conveniently stowed and available in a hurry, can help avoid inconvenience, injury, and vessel damage.